In my last article, I decided to give NHibernate a try to try and get my mind around what an ORM brings to the table. I took a few hours and managed to get a simple example working, and was able to read and write data to the AdventureWorks database. My example was simple though, now I would like to try and dig a little deeper into NHibernate. I added the joined-subclass section to the mapping file, which tells NHibernate how to load the information that is specific to the employee. I loaded a random employee from the database (ContactID = 1001) and I was able to return the correct data. I was worried that this solution would break previous examples. 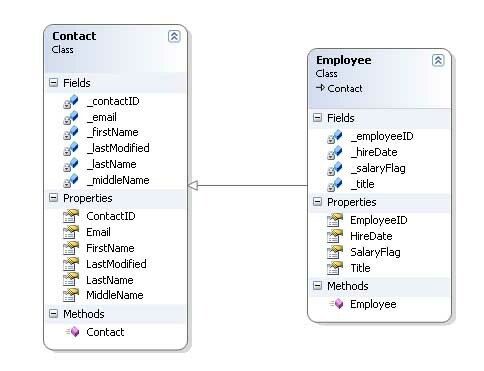 In the AdventureWorks schema, not all contacts are employees, which is consistent with our data model. Since I modified the mapping file for the Contact class, I thought I might have broken things in the situation where I load a Contact record that wasn’t actually an employee. NHibernate handled this situation perfectly, and I was able to load the contact record successfully. There are several new additions to these mapping files. First, in the Order class, I have a bag construct, which specifies a one to many relationship to OrderDetail. A bag means that I have a collection of objects, and is mapped to the IList in my class definition. The one-to-many construct also makes sense, because 1 order has many line items. In the OrderDetail class, we have a one-to-one relationship defined to the Product class. This is also intuitive when you think about it, because a single line item represents 1 product. The quantity purchased can be more than one, but we’re still talking about a single product. I plugged in a valid order ID from the database, and everything loaded perfectly! I’m starting to see the power of NHIbernate, although mapping relationships can be a little tough to grasp at first. When learning how to map classes, I found the NHibernate site to be an invaluable resource, so be sure to check it out. Next time I will take ActiveRecord for a spin and see if it makes the process of mapping classes any easier. How do I make such inheritance in NHibernate??? If I understand correctly, it sounds like you have the same sort of inheritance that I used in my example. I think that you want to put a joined-subclass entry in your Client mapping file, similiar to what I did above in my Contact class. Yes I tried that.. but what happens when you want to update the fields of the User ??? I did it and the query that is produced is like … ‘update User set… where ClientId=?’. But the ClientId is not the unique id of the User table (the unique id is another field which I call UserId).